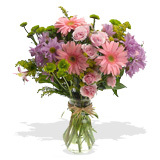 Romantic Flowers At FlowerFresh we take care that you not only get to choose the most beautiful romantic flowers to convey your love, but you also have a choice of differently designed bouquets. A romantic flower arrangement can help you say those three special words that many people find hard to say. The most romantic flower, and quintessential symbol of love and affection, is the rose. To express your love on a special occasion, present your loved one with a romantic flower bouquet and it will make the occasion all the more special.